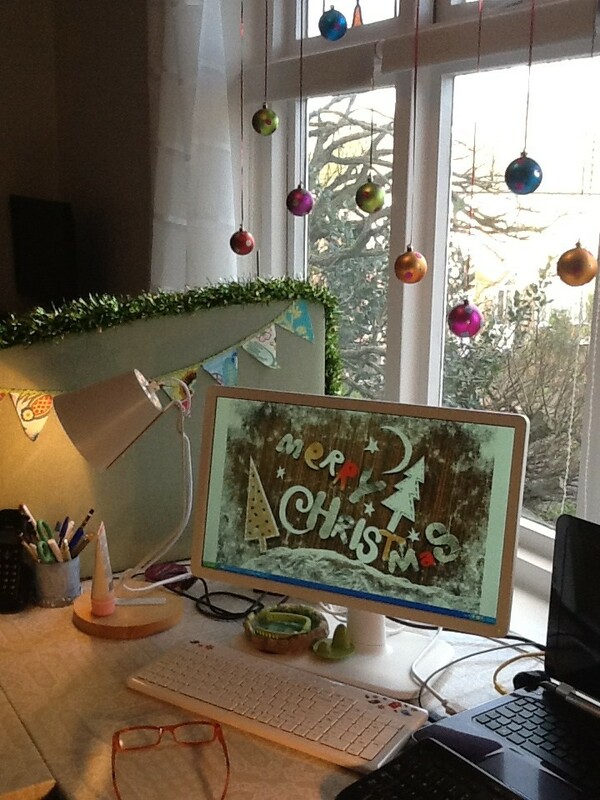 Feeling pretty festive after a Christmas performance with our local community choir at the weekend, I decided to decorate my home workspace. I had two criteria; use things already in the house (ie spend no money that’s not already been spent!) and get it done in half an hour. On the basis that the things I can see while sitting at my computer are going to have most effect on my frame of mind I’ve started with a few quick and simple things. Green tinsel on the partition screen. I share the office with my partner Steve and we put the partition up to avoid having to look at loads of wires and the back of each other’s computer. The bunting was already there. Spotty and colourful baubles in the window- they’re hung using thin shiny ribbon tied round the curtain rail. A festive desktop for the computer. It would have been easy to spend all day browsing the millions available so I made myself choose from the first site I went to. It suits the feel of my office. Ta dah! Well for now at least. More is more as far as Christmas decorations are concerned!